Read the digital version FREE! 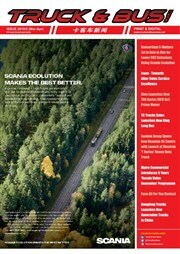 The emphasis of the magazine is on feature type articles including company profiles, interviews and product features and reviews of events within the South East Asian truck and bus sector. An industry news section is also included. Truck and Bus News is printed in English and Mandarin Chinese, making the magazine accessible to a wide range of readers within Malaysia and Singapore as well as within the wider South East Asian and Chinese markets.